Is she finally getting a proper job?! In her most recent publicity splash, internet sensation Kim Kardashian has announced her intentions to study law and take the bar exam in 2022, but why? Surprisingly, this seemingly left-field announcement does have some logic behind it. 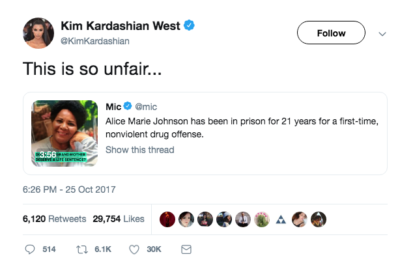 Not only was Kim Kardashian’s father Robert Kardashian famously an attorney, but also this move comes after events last year whereby Kim (yeah I call her Kim, we’re tight like that) aided in the release of a 69 year-old Grandma imprisoned on a cocaine trafficking and money laundering case. The case, which wasn’t simply the plot to a Legally Blonde-esque late 90s flick, was heavily reported on and was more importantly, putting my vacuum of enthusiasm regarding the Kardashian’s aside, genuinely uplifting and a real triumph for the social media star as Ms Johnson’s was ultimately commuted by Trump. However, I’m not completely convinced by her claims of becoming a lawyer.